Today: Tara Duggan gives vegetables the nose-to-tail treatment, and gives you a few free books. 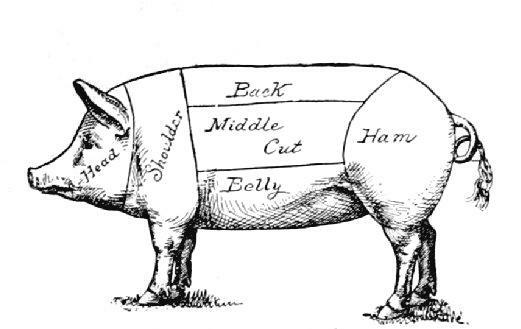 You've likely seen the macho chef on TV or on the subway with a tattoo of a whole pig somewhere on his body: divided into cuts like a map, it is a walking advertisement for the nose-to-tail movement. Use the whole beast, it pleads. Use it all. 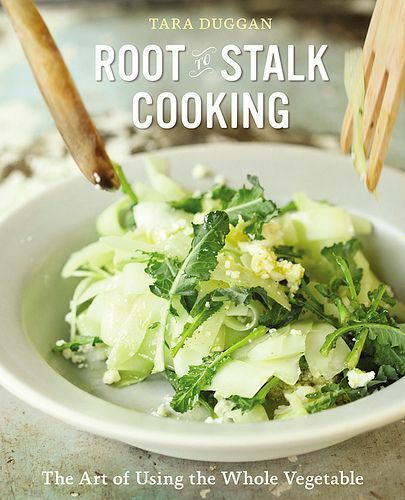 With her new book, Root to Stalk Cooking, Tara Duggan is here to be the same sort of advocate for vegetables. Her recipes use every possible part of the vegetable, from corn husks to broccoli leaves to apple peels. (She soaks her peels in bourbon. We like Tara.) We recently chatted with her about minimizing kitchen waste, the rules of vegetable stock, and how to include vegetables in dessert. It was a combination of what I was seeing in restaurants and farms in Northern California. I wrote an article in the San Francisco Chronicle a few years back called “Scrap Artistry” about restaurant chefs serving battered swiss chard stems with blood orange aglioli and making Fennel Risotto with fennel stock, garnished with fennel fronds. They were naming the extra vegetable parts on the menu just like they would with animal parts, leading off the nose-to-tail movement. 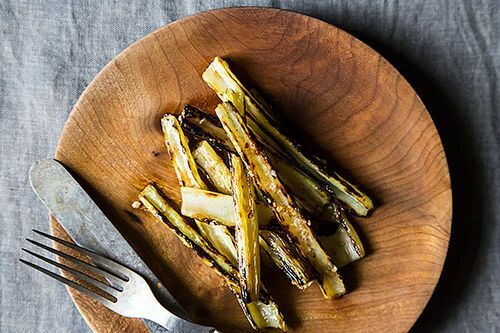 Another way to use your chard stalks: grilled, dressed, and served as a side dish. I was also spending a lot of time at my brother's farm. I would notice things like how the broccoli plants had these amazing leaves that no one seemed to ever eat, even though they are sweet like broccoli and silky and tender like spinach. Because the farm has limited water and is solar powered, you’re always aware of waste. 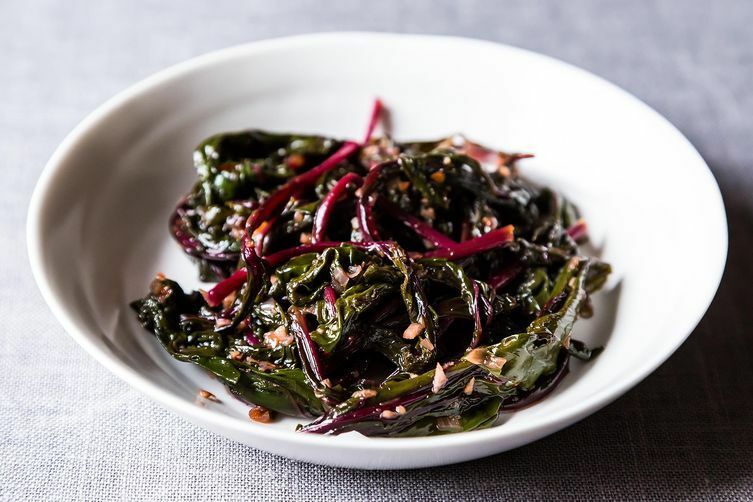 It seemed strange that no one had thought to cook these delicious leaves, or the gorgeous stems in a bunch of rainbow chard. What is the most underutilized vegetable or vegetable part? Broccoli stems for sure. They are often just cut off before the consumer even sees them, or home cooks often discard them. If you just trim the end and cut off the thick skin with four quick cuts, you have sweet, crunchy batons you can eat as crudités, stir fry, or shave into salads. What's the easiest way for home cooks to reduce vegetable waste? If you think ahead when you're buying, you can be creative with some of the extra vegetable parts instead of buying others. For example, use beet greens in place of a bunch of chard -- they're very similar in flavor and texture, and actually close cousins botanically. I also use leek greens as a mildly onion-y green in soups and stir frys -- they take about 10 minutes to become tender, and then they’re delicious. Sometimes I'll swap fennel fronds for dill. It’s not an exact match, but they have a similar texture and flavor profile. Basically, think about ways you can incorporate the bonus vegetable parts into dishes so you can be sure they’ll get used. And be flexible with flavors. Are there any vegetables that should never be added to vegetable stock? Artichoke parts. They smell terrible after a bit of boiling and become very bitter -- the exact opposite of what you want them to be. Beet parts aren’t ideal either, unless you like pink stock. Any favorite ways to sneak vegetables into dessert? If you’re preparing a lot of tomatoes and cucumbers this time of year, many recipes call for removing the seeds, which are surrounded by delicious tomato water and cucumber water. I love collecting the juices from cutting and deseeding tomatoes and then making a granita flavored with a little sugar syrup, salt, and a pinch of cayenne. Its flavor is the essence of tomato. I also like to use up an extra half of an avocado in a mildly sweet lassi, or purée extra roasted butternut squash for ice cream. When it comes to real vegetables, fennel is so naturally sweet that you can candy the stalks. Just slice them thinly, toss in simple syrup and dehydrate them in the oven until crisp. Want to implement root-to-stalk cooking in your own kitchen? 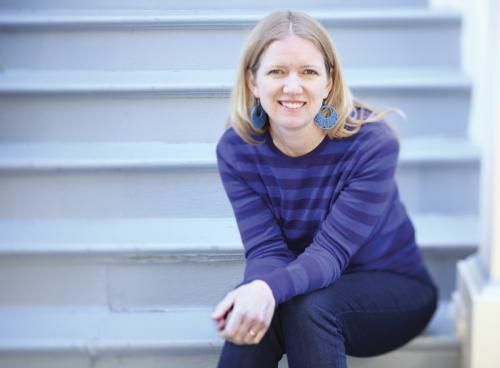 We're giving away five copies of Tara's book. To enter, tell us in the comments: What's your favorite way to use up vegetable scraps? We'll choose five winners at random by Friday, September 13 at 3 PM EST. Cover photo and photo of Tara by Clay McClachlan. All other photos by James Ransom. I use radish tops in salads. I also make and freeze pesto a la Carol by using any green leafed vegetable in garden such as basil, swiss chard, winter kale. Like so many others here, I make stock from vegetable scraps. I also use shrimp shells to make a very flavorable fish stock. When they are in season, spotted prawn shells make a fabulous stock, perfect for making risotto. I will second antoniajames's comments below about using corn cobs, husks, and silks to make corn stock. So versatile and so good! Lastly, one of my favorite root-to-stalk cooking recipes comes from Lidia Bastianich (Lidia's Family Table), and it's simply titled A Smooth Sauce from a Couple of Tough Vegetables. You take asparagus stubs and the top and outer layers of leeks and boil them gently in water with garlic, onion, olive oil, salt and pepper. After all is soft and water has evaporated down, puree the vegetables, strain through a sieve, thin with boiling pasta water and serve with your favorite pasta. Truly delicious -- and very simple to prepare! I always use vegetable scraps for a nice vegetable stock. I definitely prefer broccoli stalks to the "trees" for cooking or eating raw. We end up giving a lot of veggie scraps to our dogs, who go nuts for carrot peel. I save it all for stock, unless I can whiz it into a pesto. One of my favorite chutneys is from a recipe handed down from my great grandmother. It uses the central thready part (that surrounds the seeds) of pumpkins & squashes, toasted along with Urad dal,tuvar dal, mustard, coconut & tamarind, and then blended to a paste. Another favorite at home is a relish made from the center of cauliflower & broccoli stalks. Most green leafy scraps go to my house rabbits, Emmett Lee and Beatrix. And we compost. Alot. Does freezing overripe bananas for future baking projects count? Thai curries and other Thai recipes are a great way to use all parts of a cilantro plant...roots, stems, leaves, and seeds! I freeze leftover herbs into ice cubes for lovely minty water in the summer or for sauces. And all peelings are boiled up for the chickens of course. I have a pickey eater who hates veggies but is a voracious meateater all stocks and stems are used to thicken gravy...no cornstarch or flour needed...the best part, he has no idea! Like a lot of people here, I keep a stock bag in the freezer for scraps. I also like to pickle chard stems (so tasty!) and I always save the greens from radishes to toss into stir-fries or pasta sauces. And, of course, broccoli stems--they're the best part of broccoli, as far as I'm concerned. I just gnaw on them while I'm preparing the rest of the broccoli. I use herb stems to make pestos or bundle them with onion and garlic scraps into pots of beans. Also, this weekend I made basil ice cream and steeped the stems in the custard rather than using (and discarding) the delicious leaves. If I knew, I wouldn't need this book! I pickle watermelon rinds, candy citrus peels, add carrot and apple pulp ( from juicing) into quick breads, and toast pumpkin seeds. I love the wonderful ideas for using corn husks! I do use broccoli leaves and stems--the plants in my garden produce a generous number of scrumptious leaves during the growing season. With scraps, I use as much as possible in making veggie stock. The parts that are damaged or otherwise unsalvageable go into making compost. I love soup, so very little ever ends up as compost.